I always look at photos of group crafters with wistfulness and a little disbelief. Where do all these people live that enjoy hand crafts? Oregon? Canada? It must be staged. Is it because I live in the Deep South that I never meet other knitters or is it because I live in the deepest, darkest corner of the Deep South? 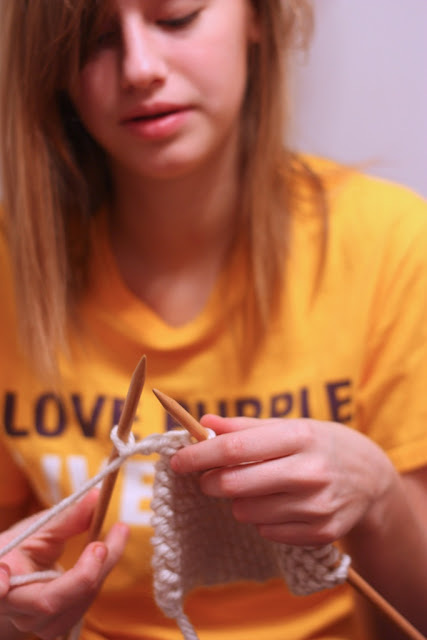 I've mentioned my knitting history before: how I taught myself as a young mom at home with two small children on a whim, but since I haven't lost interest after ten or eleven years, I think it stuck. But no matter how enthusiastic I am about it, or maybe because I am, it has never caught on with anyone else around me. I bought a Rowan scarf kit for a friend at the yarn store after she had seen one of my sweaters and was all excited about learning. She never did use the kit and has since dubbed the yarn store the "yawn store." Hummh. I taught my reluctant daughter how to make fuzzy, Fun Fur garter stitch scarves when she was a preteen, and she actually made one. Of course, it was about 12 inches long, just the right size for her stuffed cat, but it was a scarf and group knitting was a happenin' at my house! But it only happened for a day, the scarf was her last, and was probably eaten by the vacuum cleaner. Lots of people say they want to learn, and I really think they'd enjoy it, but they just can't seem to power past cast ons and garter stitch. That's probably why knitting groups are so popular, even if you move at a tortoise pace, you're still getting the fun of being out with friends, unless you live in Knitting Siberia. This is one of those things that would make living in a big metropolis preferable. Fast forward to a few months ago when some of my daughter's friends saw a scarf I had made her and said they wanted to learn to knit. I was doubtful (did they all have stuffed cats too?) but they planned a girls night over at our house complete with food and movies, so I went out and bought size 10 aluminum straight needles and 2 skeins of Thick and Quick yarn at Wal Mart for each of them to make green and white striped garter stitch scarves. Then they all changed their plans and the skeins sat in a corner of my daughter's room until they'd collected so much dust and dog hair I feared they'd doubled in size. But, one night recently, when they had nothing else to do, she took them to one of their homes and all four of them learned from my daughter, who asked for a quick refresher on cast-ons before walking out the door. Maybe having nothing else to do is the key to actually learning. I may not have been able to be part of that group, but I was satisfied to know I made it happen with ready supplies and, because of my effort, the skill is spreading. I think these girls actually will make more than one saggy scarf. They like to watch movies and talk into the wee hours, so knitting fits in beautifully. A few days later one of them emailed my daughter a picture of a perfectly even, almost finished scarf. Nice. I think the next time a friend, or even a stranger, expresses mild interest in my knitting to be polite, I may run get some cheap supplies and ambush them at their home with a scarf tutorial before they know what's happening. Come knit with me on Ravelry. 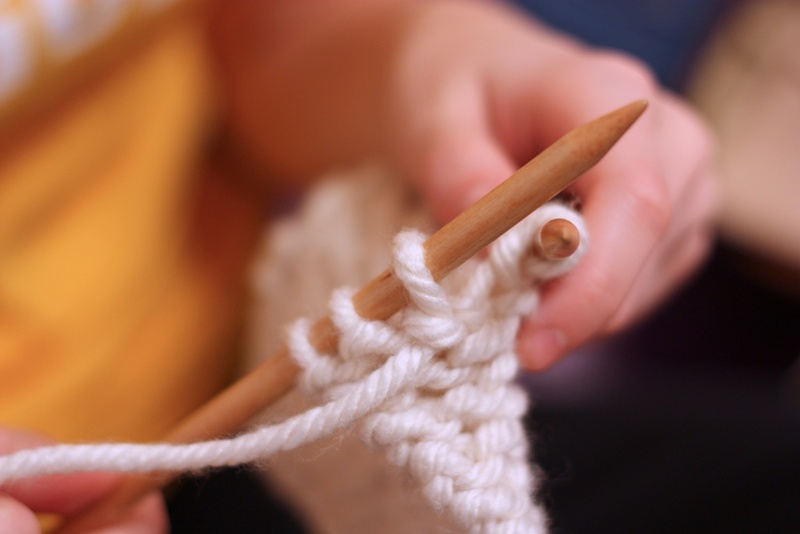 Last september I started a knitting and crocheting group with some colleagues and friends who were very interested in learning how to knit and crochet. I taught them how to crochet first, we started with some granny squares for a pillowcover. We haven't finished a single pillowcover so far, (maybe not the best project to start with anyway) but it is so much fun to see how they pick it up and how their interest grows. One friend now brings her 8 year old daughter with her and I taught her how to knit. severian, I love that you host a group that isn't as much goal oriented as it is socially satisfying. Maybe I should start something like that. 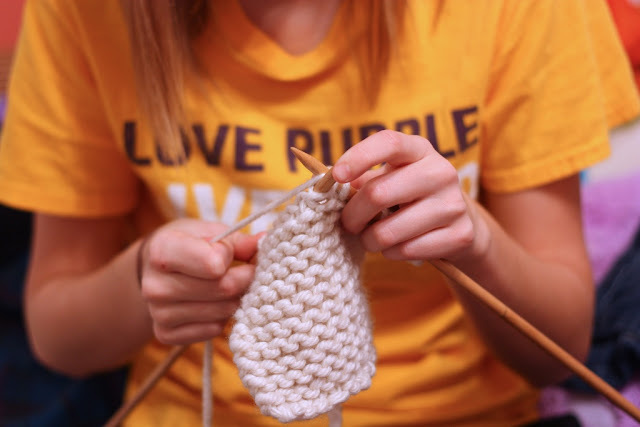 I know from personal experience that knitting is a therapeutic and calming activity, but teaching it to others, with the benefit of group comraderie... well that would be awesome. I'm going to think about this. Yarny Days, you are so fortunate to have learned crocheting and knitting from people so meaningful to you. I remember my mother clamping a child's sewing machine onto a table for me to use to sew doll clothes. This is a very special memory for me. Basically , any memory of my mother is special to me. I wonder if we realize how precious our involvement with our kids, or children in our lives, might be to them one day?